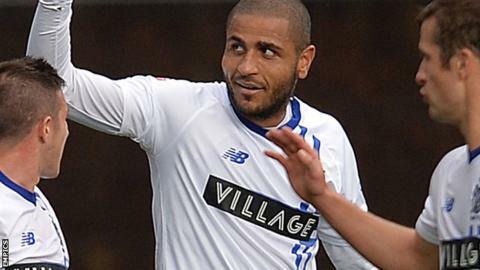 Leon Clarke's ninth goal of the season saw Bury overcome Colchester and move up to third place in League One. Shakers goalkeeper Rob Lainton denied Colchester's Joe Edwards and George Moncur in the first half, while Bury's Chris Hussey struck the bar. Lainton continued to keep out United after the break before Clarke headed in a Joe Riley cross to win the game. The victory sees Bury extend their winning run to five games and their unbeaten away record to 17 games. "Every point we've got we've had to dig deep, it's part of football, it's something that we try and set a team up to give us everything and that's what they have done. "The goal deserved to win the game. Did we deserve three points? The work we did out of possession and what the authorities have given us to deal with this week, in Peterborough on Tuesday night then there is Colchester, 80 miles apart. "There's not many teams that will cover that distance over the last four days. That took its toll and took into account. But I'm absolutely delighted with the shift my players have put in." Match ends, Colchester United 0, Bury 1. Second Half ends, Colchester United 0, Bury 1. Chris Porter (Colchester United) wins a free kick on the left wing. Substitution, Colchester United. Chris Porter replaces Tosin Olufemi. Attempt saved. Callum Harriott (Colchester United) right footed shot from outside the box is saved in the centre of the goal. Marvin Sordell (Colchester United) wins a free kick in the defensive half. Goal! Colchester United 0, Bury 1. Leon Clarke (Bury) header from the left side of the six yard box to the bottom right corner. Assisted by Joe Riley. Substitution, Bury. Reece Brown replaces Danny Mayor. Corner, Colchester United. Conceded by Tom Pope. Corner, Colchester United. Conceded by Robert Lainton. Leon Clarke (Bury) is shown the yellow card for a bad foul. Attempt saved. Gavin Massey (Colchester United) right footed shot from the centre of the box is saved in the bottom left corner. Substitution, Colchester United. Alex Gilbey replaces Joe Edwards. Attempt saved. Marvin Sordell (Colchester United) right footed shot from outside the box is saved in the top centre of the goal. Corner, Bury. Conceded by Joe Edwards. Attempt missed. Owen Garvan (Colchester United) right footed shot from outside the box is close, but misses to the left.